The Tower represents a building on which lighting strikes. Two characters seem to be escaping the edifice, but the serenity of their faces shows that the event is not dramatic. They seem to be suspended in the air, with no worries about the tower that is collapsing. The sun is shining and we can see a field coloured with yellow and green that suggests that life is still around the tower, even if it is caving in. 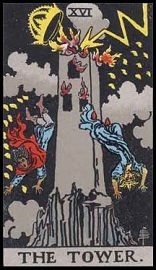 Do not be foolish: if the tower is falling down, the colours and the tones adopted on this Tarot card have a positive connotation that indicates a salutary crisis. The Tower describes an explosion, which recalls courage and expresses the desire to move on. It can evoke self-sacrifice for an important cause, a realization of life’s fragility, a revelation. In your love life, the Tower can announce a sudden lighting strike. The Tower is a reference to a dangerous destructive behaviour; it can be hostile and can announce a catastrophe. She is the sign of chaos. Depending on the cards with which she is associated, the Tower can announce a break-up or a dismissal. You are going through a difficult time and you risk facing disappointment. Beware of your entourage, especially professional. Distracted, something is not right in your life and you can feel it. You lack lucidity and do not know anymore how to get out of this awful situation. This is a serious warning against a failure you could suffer, one that you must not have identified. It can be a professional or a personal frustration, and the fact that you did not see it coming is even more painful. Nevertheless, this does not mean that your project is unrealizable, but this is a clear warning. You are about to fail; you have to reconsider your project and prepare a fresh start. You have engaged yourself too quickly into something that is probably not for you. Be careful and remember that it is still time to turn back, it may avoid you a lot of worries. You are moving towards a huge failure, you absolutely have to reconsider the established order. You risk a break-up, even a divorce. Your love life will become even more complicated than it already is, and you will have to change something to go back to a more stable and comfortable situation. You are in an unavoidable situation. You have to positively manage the upcoming change to get positive things out of it. It may be hard to accept it, but it will be salutary for your future.